The motto over our church door reads 20 C+ M+ B 19; that is, Christus Mansionem Benedicat 2019 / May Christ Bless this House, 2019. Here are my questions, for me and for each of us: When/how do I encounter Christ? Where do I seek transformation? Where do I need to offer another way to someone else? These questions imply that we meet Christ again and again and as we grow we will always need transformation. What do you think? What a beautiful and wondrous gift we are given. May our lives and the life of our congregation shine forth with this gift into the world. It was a frigid and grey beginning to Monday morning at 6:00 AM but my spirits rose as I saw a stream of cars pulling into the Rupp parking lot and folks walking to the arena. As it turned out there were 1,100 people at the UNITY breakfast. Our table of 8 included Bp Mark and Helen, Canon Elise and several from Good Shepherd. The program was good and inspiring and the music heartening. The theme of this year's breakfast was UNITY: The Promise of Hope. The winner of the essay contest was a middle-school young man who said "Division and violence make no sense to me. What does make sense is to Honor the Other in Peaceful Equality. HOPE." Wow! A motto to remember and live into. The sun shone brightly as we gathered for the Freedom March. 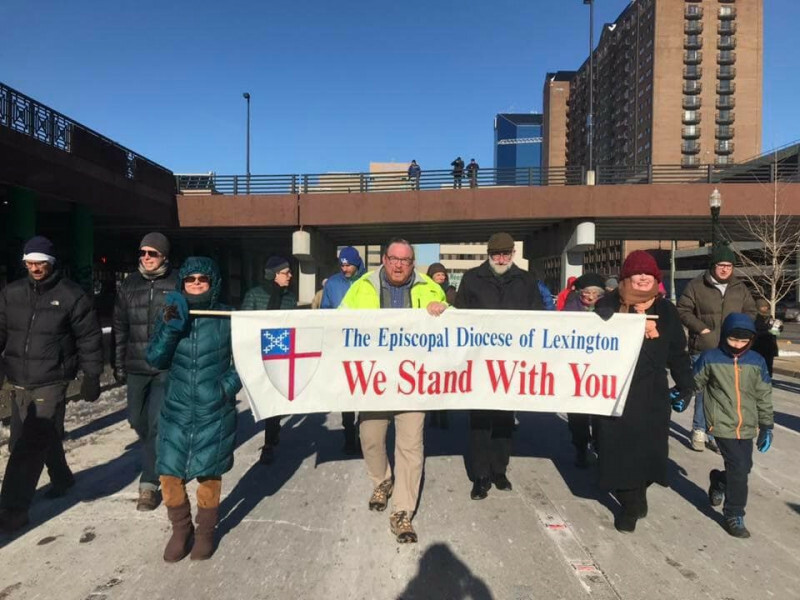 The Episcopal banner and folks were thirty-third in the line-up and we moved into the bright sunny morning along the route planned. More people found us and joined in warming up (well, at least I did . . . had to take my scarf off and open the top button of my coat. Maybe that's the Minnesota in me!) as we marched along with at least 1,000 others. It was a great morning: a reminder of how far we have come and how much there is yet to do. Faith is the star that guides you. I found this explanation of our Christmas/Epiphany liturgies in the writings of Thomas Keating: The key to understanding the Christmas/Epiphany mystery and to receiving it is the openness we bring to it. "The message is: We belong to the universe and to the God who created it. We belong to the God who is within us. We belong to the human family in which God dwells and manifests. The light and life of God are available in the measure of our increasing receptivity. Each year that we celebrate this opening to the gifts of God, we open more." What a beautiful and wondrous gift we are given. May our lives and the life of our congregation shine forth with this gift into the world. The rites of Holy Week are at the very heart of the Christian year, central to our faith. We will journey with Jesus as he enters Jerusalem with joyous greetings and waving palms and then drop right into the reading of his passion on the way to and on the cross. We are reminded that Jesus' suffering and death had a purpose, and though his soul was troubled when the moment had arrived, he nontheless chose to face the fully human experience of dying so that we might live a whole and holy life IN HIM. On Maundy Thursday we will celebrate Eucharist, as Jesus established it in his last supper with his disciples. Then we will remove all the vessels and vestments from the altar and leave it bare. There will be no blessing or dismissal, and all will leave in reverent silence. On Good Friday we celebrate Jesus conquering death itself...the reason we call that day "good". There will be solemn readings and the Passion story followed by the Veneration of the Cross. Once again, after praying the Lord's Prayer, we will leave in silence. Those who wish to do so may remain for the Stations of the Cross procession. These rites prepare us more fully for the JOY AND DELIGHT of EASTER DAY. I hope many of you will make time in your week be with Jesus in these times of solemn remembrance.